Racelle Rosett, an award-winning television writer whose credits include “thirtysomething” and “Blossom,” has just published her first volume of fiction, “Moving Waters: Stories.” Rosett’s notable successes with the short story include winning the Moment Magazine-Karma Foundation Prize for Jewish short fiction and the Lilith Fiction Prize. Her work has also appeared in “Tikkun,” “Ploughshares,” the “New Vilna Review,” and “Jewish Fiction,” among other publications. 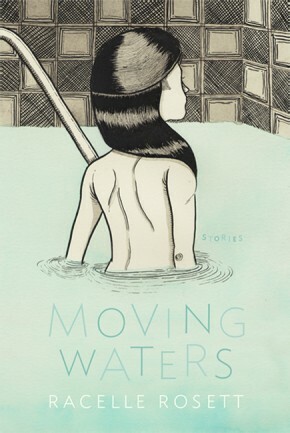 The title story of “Moving Waters” explores sexuality in all its permutations, including the end of a marriage and the healing effects of immersing in the mikveh. Later, in “The Unveiling,” a young widow’s makeover coincides with the unveiling of her husband’s tombstone. In other stories Rosett ponders the efficacy of lamed vavniks — the 36 righteous people who keep the destruction of the world at bay — and the prohibition of saying God’s name out loud. In a recent interview with the Sisterhood, Rosett discussed her new collection of literary fiction and explained how this latest chapter in her writing life has reflected a deep examination of her Judaism. BOLTON-FASMAN: You wrote for television for almost three decades. How has that type of writing influenced your literary voice and short stories? ROSETT: I look for stories in the same places — in moments of transition, places where a character struggles and finds her way. But writing for television is more collaborative. The stories [in “Moving Waters”] represent a very personal exploration. In them, I was immersed in a world that held a lot of contradictions and I needed to get inside of them to make sense of it all. Your title story is about fluidity in sexuality and individuality. Why did you lead off your collection with the image of a mikveh? There are two answers to this question. I did a reading from “Moving Waters” for “Zeek” last fall and met a wonderful young artist named Will Deutsch, who heard the title story and shared some of his work with me. His artwork depicting immersion into a mikveh was so tied to what I was doing that I immediately imagined his work adorning the book’s cover. I loved the idea that at first glance the image looked as much like a swimming pool as a mikveh, which underscores the theme of the book that we are in two worlds at once—the ancient and modern. I also felt drawn to the image of Deutsch’s mikveh because I felt as if I were literally stepping into a pool. I hope this is the experience for the reader in the sense of stepping into the lives of these characters and being engrossed in their world. I also hope readers will be moved to reclaim and redefine mikveh as a ritual that is relevant and useful in contemporary life. I am compelled by the idea of reclaiming and redefining mikveh as a ritual that is relevant and useful in contemporary life. In many communities Mikvah is now being used as a demarcation of transition — to heal from losses like infertility and divorce as well as celebrate new lifecycles like adoption and recovery. Your stories reflect an intensive interest in Judaism. Can you say something about your own Judaism and how it has influenced your work? What is most surprising to me is that like the characters in my book, Judaism became relevant to me unexpectedly. I brought Shabbat into our family lives as a way of impressing the idea of community and rest on my children. I did that to anchor them in a place where many forces are competing for their attention. Do you consider yourself a Jewish writer in the sense that Judaism inspires and moves your stories along? I certainly feel that [Judaism] informs the stories in “Moving Waters.” My characters embody what I most value and want to keep from my tradition. I think as you mature in your faith you’re constantly holding it up to the light and reappraising it. I was watching “Weeds” recently and there was a plot line with a rabbi and the idea of struggling with yetzer h’rah — the Evil inclination. You write from a place that is shaped by everything you are. Having said that, I may write a story or a script in which the characters are not Jewish but my belief about the world will not change. Do you still write for television? I do. I’ve had an ongoing role in television over the years as a consultant working with writers I love. Several months after I completed the story collection I met an extraordinary young woman and I was compelled to write a script about her that is still in the works. What’s on your agenda this fall? I’m doing a number of visits to temples and Jewish Book Festivals as part of a Jewish Book Council author tour. I love visiting Jewish communities and seeing their dynamic and energetic engagement. For example, I attended a service in San Francisco that, in addition to being in a beautiful setting, was entirely relevant both socially and politically. It was thrilling to see the kind of deliberate participation not held over from generational guilt but was about bringing together a community in a purposeful and joyful connection. This entry was posted in books, culture, Jewish feminism, Judaism by judy bolton-fasman. Bookmark the permalink.